It’s time again for another update on what has recently happened around KDE Itinerary. Since the last two month summary we had the KDE Applications 18.12 release, so most of the following developments will be for the April release. A focus area in the past two month has been access to base schedule and real-time schedule data for public transport networks, based on Navitia as a backend. That’s a big subject, I’ll write a separate post about the details soon. 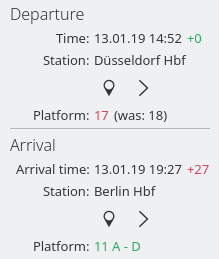 This data has been integrated in KDE Itinerary to show train delays and platform changes, and work is ongoing to allow selecting alternative connections for unbound train reservations. To make the real-time data display more useful, there’s now also an option to automatically poll for updates. This tries to conserves bandwidth and battery by polling with decreasing frequency the further away an arrival or departure event still is. Update polling is not limited to public transport data, but also works on PkPass files specifying an update URL. PkPass files containing train tickets are now also supported. There is now a generic extractor for the most common RCT2 ticket types. RCT2 is the standard for international train tickets in Europe, and is also used by some operators for domestic tickets. This gives us at least basic trip information for SBB, ÖBB, DSB and NS. Since trip information from RCT2 data is not particularly detailed, the extractor engine can now decide to discard such results if better data from custom extractors is available. The extractor post-processor now tries to split up some data fields that often contain combined data, such as airport terminal information being part of the airport name, or postal codes ending up in the city name field. The custom extractor API for parsing dates and times got better at parsing non-standard month name abbreviation that QLocale doesn’t understand. New custom extractors have been added (e.g. for NH hotels), others got support for multiple languages (e.g. Easyjet). Besides improving data extraction, we now also have Android support for KF5Notification starting with KDE Frameworks 5.55. 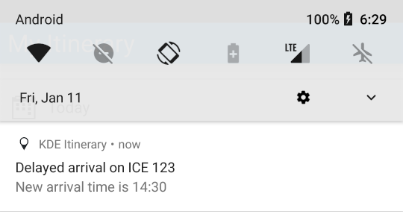 KDE Itinerary now handles new intents on Android, that is opening a file handled by KDE Itinerary while the application is already running now works correctly. Selecting a boarding pass on a multi-traveler booking actually works now. Duplicated code for handling the merging of multi-traveler bookings has been merged throughout the application, and a number of issues in this area have been fixed. Double-taping a barcode now also increases the screen brightness to maximum on Android, to make barcode scanning more reliable. The KMail integration now also supports older KDE Connect versions. If you want to help in other ways too, see our Phabricator workboard for what’s on the todo list, for coordinating work and for collecting ideas. For questions and suggestions, please feel free to join us on the KDE PIM mailing list or in the #kontact channel on Freenode, or next week in person at FOSDEM.